You will also have the ability to see what we have in store for our Live Auction, Super-Silent Auction, Silent Auction, and our His & Her Raffle Prizes. There is much to see and the catalog will continued to be updated as more items are donated. Anyone can participate in the online auction, so if you have family & friends that live far away, forward this message onto them and they too can join in on the bidding action. Just as a reminder, if you have not purchased tickets yet, you still have the ability to do so. Click Here and follow the instructions. 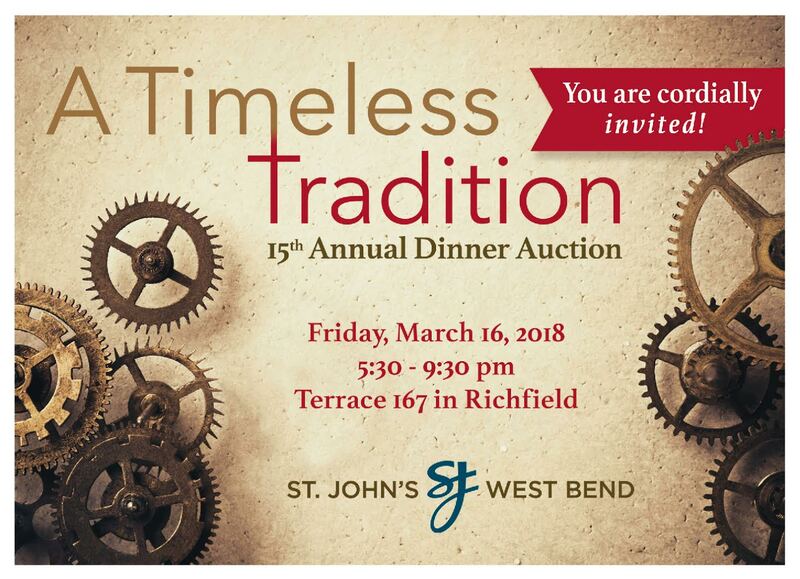 The St. John’s West Bend Foundation will again support the auction by matching 50 cents per one dollar (net) raised, up to $50,000! What an amazing gift. The proceeds for this year’s auction will be continuing to support the updating of the Audio Visual within the St. John’s Church, installing Air Conditioning within the Elementary and Middle School, and supporting the Mission Grant Fund. Questions or Concerns, please contact Craig Toerpe, Director of Stewardship & Gifting at 262-334-4901 or ctoerpe@stjohnswestbend.org.